When Amy moves in with her great-aunt Mae in the tiny town of Rockville, she's grateful for the chance to slip away to a place where no one knows her, far away from all of the gossip of her old town, her mother who doesn't understand her, and, most importantly, her abusive ex-boyfriend. Though she is distant with others in her new school, she befriends a well-spoken and well-mannered boy named Henry, who lives beyond Aunt Mae's property just a bit. Henry is unlike any one Amy has ever met...and that's because he's not from her time period. For Henry and his family, it's still the summer of 1944. They are trapped on their property in the endless, idyllic days of summer, unable to move forward to face the disaster that awaits them in the future. But as Amy and Henry get to know each other better and fall in love, they both learn to overcome their fears and face an uncertain future. 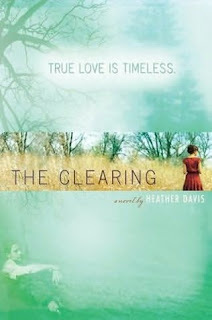 The Clearing is a sweet and emotional read with a twist. Readers who like romantic books with light paranormal elements will enjoy this time-travel novel. Davis's characters are genuine and convincing and seem to really connect despite the many years between them: Amy is vulnerable and still hurting from her emotional and physical abuse, and Henry is frustrated and scared at what the future will bring. They find solace in each other and are able to identify in each other through their emotions. The pace of the novel is even, and volleys back and forth between Henry and Amy's points of view. There are certain complications to having two protagonists belonging to very different times, but Davis manages it quite well and keeps hers readers on edge the entire time, wondering as to how the story will conclude. The ending is a bit rushed and vague; some may wish for more specifics, but its openness will also be satisfactory for other readers. Overall, this unique and romantic book is a reminder that life is about both sad and happy times, letting go, and having the courage to face tomorrow, which is an important and relevant message for teen readers especially. Cover Comments: I like the blue of the cover, and I think that the picture of the field with the girl is pretty. The red dress she is wearing ties into the plot, which is neat. This is a very pretty and fitting cover! ARC received from Amazon Vine. This kind of reminds me of The Lake House. Interesting. I do love time travel books. Never Cry Werewolf was good, so I'll have to read this.